This excel Challan 280 for payment of Income Tax should be used for making payment of income tax on companies (corporation tax) or income tax other than companies. This challan should not be used for deposit of Tax Deducted at Source (TDS) for which separate ABCAUS utility ITNS-281 has been provided. Please note that Finance Act, 2013 w.e.f. 01/06/2013, had inserted Clause (aa) of Explanation to sub-section (9) of the section 139 providing that a return of income shall be regarded as defective unless the self-assessment tax together with interest, if any, payable in accordance with the provisions of section 140A, has been paid on or before the date of furnishing of return. However, the Finance Bill 2016 has omitted the said clause (aa). The amendment will take effect from 1st day of April, 2017 and will, accordingly apply in relation to assessment year 2017-2018 and subsequent years. A separate challan is required for each type of payment by placing a tick mark at the appropriate box in the challan. You are required to fill PAN, Assessment Year, Amount, Cheques details (other than cash) etc. After the challan 280 is paid to the bank, make sure that the counterfoil contains seven digit BSR Code of the bank branch, date of deposit and five digit challan serial number. 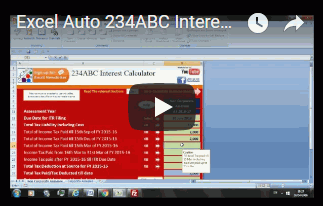 ABCAUS excel based auto Income Tax payment challan ITNS 280 is very simple and user friendly. The user is required to fill the data in a pop up form and challan form in excel is updated automatically. Users can also watch the following tutorial video to know how to use this utility. The ABCAUS challan has an inbuilt database facility to add assessee records to it so that users don’t have to feed repetitive assessee information for the second time of challan generation. Also while creating the database there is an inbuilt PAN Structure check to alert for a wrong PAN structure being saved in to the database. However users should make sure the they enter a PAN in the database which is not only valid in structure but also not non-existent in database of Income Tax department. However, on users request, an option to unprotect database sheet has been given for making entries directly in the cells instead of form. Users are advised to exercise extreme care in filling correct PAN. Users are not required to give blank spaces while filling the pop up Challan form. The excel challan automatically reads the text string and places them in appropriate boxes. Dropdown list for various options and check boxes have been provided to save the time of the user. Macro should be enabled to use this form. Users are advised to read help file first. In case users are not aware of how to enable macros, they can download a help file. Thank you. Well made and very easy to use. Have a few suggestions. In the section on “Total (In Words)” if the “Units” value is zero, then it should fill ZERO in the space provided for UNIT value and NOT LEAVE IT BLANK as is the present case. Secondly, in the section on mode of payment (Cash / Cheque etc.) if paid in Cash, the “Date” and “Drawn on” should be left blank these are date and text fields, instead of the “0” filled in the fields which is inappropriate. These are small changes that will make the utility complete.